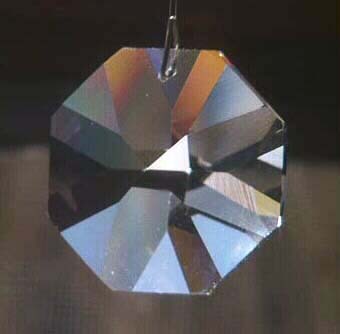 This crystal is wonderful for making rainbows. Here are a number of pictures, showing how different the crystal can look in different types of lighting. The smooth beauty of the crystal and the rainbows it makes in the sun make this crystal well worth having in your collection. Also makes a wonderful, generous sized gift! Sundrop 60mm and all of the Sundrops are fabulous Rainbow makers! THE BEST AND BRIGHTEST! SUNDROP 50mm $45.99 SORRY- SOLD OUT ~ Please See Our Wonderful SunDancer Crystal ! Here is the Sundrop "Family". Left to right, you can see the Sundrop in 60mm (2 3/8 inches) size, 50mm, 40mm, 28mm, and a U.S. Quarter for comparison. That's a 40mm Ball peeking into the picture on the left. Here is a line drawing of the Sundrop, showing the facet pattern. It is difficult to see the details in the photographs because the crystals reflect so much light! SUNDROP 40mm $39.99 SORRY- SOLD OUT ~ Please See Our Wonderful SunDancer Crystal ! For your FIRST crystal, if you do not have any yet, a Sundrop in any size is a perfect place to start! This 40mm crystal will introduce you to the wonders of rainbows and beautiful crystal with just a tiny investment. You deserve it!